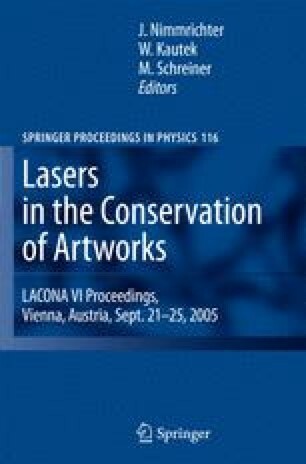 The application of infrared laser wavelength (at 1064 nm) for the removal of pollution encrustations from stonework is limited in many cases by discoloration effects, which are commonly known as “yellowing”. The understanding of this effect is crucial for the investigation of cleaning methodologies. Several methodologies have been proposed aiming to avoid or rectify such unpleasant colorations. The most promising ones are based on the combination of a cleaning beam at 1064nm with an ultraviolet beam at 355 nm, either in spatial and temporal overlapping and in variable fluence ratios (wavelength blending approach), or in sequential irradiation conditions (sequential approach).